We at Jefferson Baptist MDO are pleased to offer a quality and reputable program. Our curriculum is child-centered, educationally sound, and developmentally based. Christian teachers are always available to guide, love, and listen to your child. Our teachers plan interesting and engaging activities incorporating songs, stories, skills, arts and crafts while sharing about God’s love. We offer many opportunities to help children in their intellectual, emotional, and spiritual growth. Our program hours are from 8:55 am to 1:00 pm. - Monday, Tuesday, Thursday, & Friday. We are closed on Wednesday. We have nine classes at MDO. 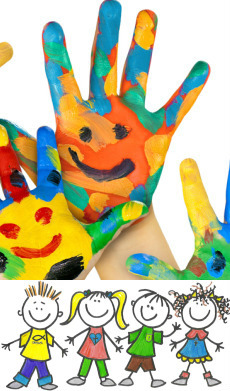 These classes range from youngest toddlers, oldest toddlers, young 2's, older 2's, and 3's. If you have a child currently enrolled in either the youngest toddler, oldest toddler, young 2's, older 2's, or oldest 2's, then we have a class at MDO for your child next year! If your child is completing the year in one of our three 3's classrooms, then they will have completed our program. We have enjoyed sharing these years with you and your child. Children who will be twelve months of age by September 30th are eligible for our youngest class. We also have classes that address the needs of our two and three year olds. Our younger children can attend two or three days a week. For three year olds only, we offer four days a week. Registration is handled by the director in person. Registration is ongoing as openings become available. The registration and “all supplies” fee of $260 for each student enrolled is due when the application is submitted. The $260 fee is non-refundable. At MDO, we want your child to experience God’s love for Him through loving relationships and meaningful encounters. Because each child is growing physically, mentally, socially, and spiritually, we provide a variety of positive learning activities. Young children learn through active exploration of their environment through self-initiated and teacher-selected activities. Our early childhood environment will provide opportunities for your child to explore materials, engage in concrete activities, and interact with peers and adults. In order for children to reach their full potential during these early learning years, it is important that we provide an environment that promotes growth and learning. Our curriculum will be guided by Louisiana’s Birth to Five Early Learning & Development Standards (ELDS). This curriculum is child-centered, educationally sound, and developmentally based. Learning centers are clearly defined areas/activities within a classroom where children can explore and learn with hands-on materials. Research shows that young children learn best through active, hands-on play. These centers engage children and make learning fun. Children manipulate materials, explore ideas, discover consequences, build, create and express themselves through art. To parents it may look like children are “just playing” but this is play with a purpose. Through carefully planned learning centers, children learn important concepts and life skills in ways that are meaningful to them. For deeper learning to occur, children need time to manipulate materials and process what they have learned. Christian teachers are always available to guide, love, and listen to children. Teachers plan interesting and engaging activities incorporating songs, stories, skills, arts and crafts while sharing about God's love on the level of each child. Our class sizes are conducive to meeting the needs of each unique individual. Each day is filled with fun and exciting activities that intentionally address age appropriate skills in a variety of ways. Group Time: Stories, songs, games, and music activities are planned. Age appropriate skills are addressed such as letters, numbers, colors, and shapes. These concepts vary due to the ability level of each class. Outside Time: Play is supervised outdoors, with activities planned inside during inclement weather. Lunch Time: Parents provide a lunch for their children. Nutritional finger foods in easily opened containers are suggested. Registration for families currently enrolled in MDO will begin at 8 AM on Thursday, January 24, 2019. Families that have previously attended MDO may register at 9 AM on or after Friday, January 25, 2019. MDO registration will be opened to new families at 8 AM on or after Friday, February 1, 2019. If you would like to learn more, please contact Joan M. Lee at (225) 923-2317, or email at jlee@jeffersonbaptist.org.